← Trouble With Editing Symbols? Does pressure and deadlines make you more productive? Ever think of writing a novel in one month? Well, okay, it’s 50,000 words, but that’s over half a novel. 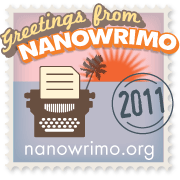 Join National Novel Writing Month (NaNoWriMo) called 30 days of days and night of literary abandon. There’s a London chapter and the municipal liaison is Gayle Remisch. Currently there are 582 members. During the month there are often meetings and cheering squads that help you stay on goal. It’s a fun month and I recommend it. Even if you don’t make the 50 K you’ll see how you work under pressure and meet a lot of really dedicated writers.